“A sense of clean city ease, through to an urban surf scene”. That’s not from the show notes of an upcoming New York label. It’s from Victoria Beckham’s show. The celebrity designer’s namesake label took a welcome, adventurous turn for Spring looking to the beach for inspiration. Maybe it’s not the most original inspiration, but the execution was fantastic. Held at Cipriani 25 Broadway, the venue boasted an opulent baroque ceiling. The clothes didn’t always match the decadence of the venue, given their playful nature. Opening the collection was a white skirt with bursts of green and wine gingham and a matching bodice. Asymmetry played its part in this collection as seen in a number of the gingham outfits, and other printed looks. Prints were something I would never associate with a Victoria Beckham collection. That changed on Sunday morning. Surfing the waves in black and white on a VB dress with a deep plunging neckline. Worse things have happened. There was also colour-blocking scenes of a beautiful sunset. Looks 21 had black, white, red, orange and yellow surfing images. It struck me as Warholian. I loved it. 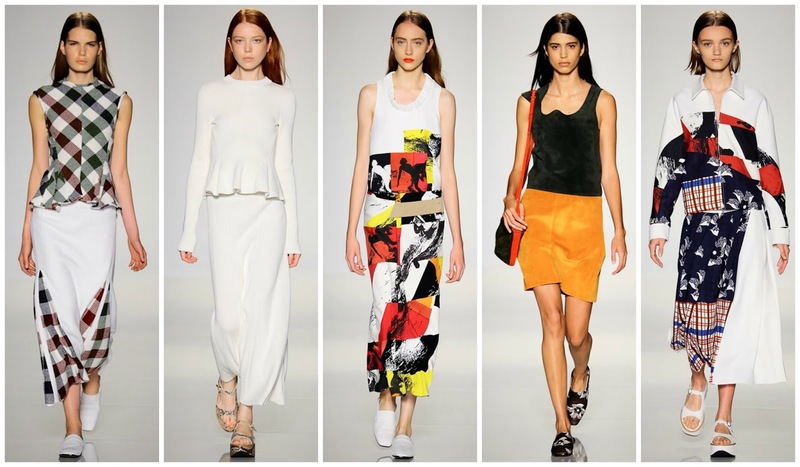 As I said, prints aren’t something you see at Victoria Beckham. That is precisely what made the collection so exciting. “Red, white, blue is in the sky, summer’s in the air and baby, heaven’s in your eyes, I’m your national anthem”. You may remember I quote this Lana Del Rey song in my Prada review, but Victoria Beckham has me borrowing it again, to describe an aspect of the colour palette from her show. Look 19, a white three-quarter-length dress, featured a cobalt neckline and a red pocket. More pops of red, white and blue were scattered throughout the collection. Is anyone else spotting the New Americana trend? It was spritely, more casual than usual. There was of course some dashes of evening wear, but those were lightweight and laid-back. There were interesting ideas and new spins on recurring shapes. Things are getting better and better at Victoria Beckham. It’s fantastic to watch.